Africa Diaries: I was at the Equator! I was at the Equator! My friend Atanu and his wife Bulbul were visiting us during Christmas and that certainly meant some travel together. We chose Mount Kenya area; not the montane forest of Mount Kenya national park though, since its dense forest cover gets in the way of animal sightings. On December twenty fourth morning, our safari commenced at a baby permissible pace. Leaving behind Nyeri County, after around three hours of travel from Nairobi, we reached the lodge where we had a reservation. The lodge is situated at Naro Moru town, a small market town in central Kenya at altitude 6679 feet or 2035 metres lying on a river by the same name; a river that starts from Mount Kenya and is fed by the mountain’s glaciers. The main industry of the town is tourism, serving as a base for hikers ascending Mount Kenya to its east. The first thing on the agenda was certainly lunch, so we headed for the modest restaurant with a thought provoking name, Kirinyaga. Kikuyu or Gikuyu are a Bantu ethnic group (in fact the largest in Kenya equal to about 23% of the country's total population) who live on the southern and western sides of Mount Kenya. They are agriculturalists, who make use of the highly fertile volcanic soil on the lower slopes. They believe that God, Ngai or Mwene Nyaga, lived on Mount Kenya when he came down from the sky. According to their beliefs, the mountain is Ngai's throne on earth and it is the place where Gikuyu, the father of the tribe, used to meet with God; thus Gikuyu was the first person on Earth to ascend the mountain. The Kikuyu name for Mount Kenya is Kiri Nyaga, which literally translates to 'God's Resting Place' or 'Where God Lives' in this case referring to Mwene Nyaga. It is not just the Kikuyus who revere the mountain, the Embu people who live in the south-east of the mountain believe that the mountain is God's home and like the Kikuyus, build their houses with doors facing towards it. I marvelled at how such reverence has successfully save guarded our mountains, trees and water bodies for centuries all over the world – till the sanctity gave way to modern day need and greed. Interestingly, the ancient Kikuyu traditional beliefs (Creation theory, Mountain, One God, Prophets etc.) are very similar to Jewish traditions. Some believe that the Kikuyu ethnic group are descendants of the lost Jewish tribes from the days of Moses. By the time we finished lunch, there was not enough daylight left to venture far from the mountain lodge. 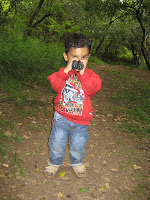 A plan B was thought of - what better than a nature trek in the idyllic surroundings. One of the streams from Naro Moru river flows within the lodge, the continuous rhythm of the gurgling water accompanied us wherever we went. There were birds hiding behind the tree cover on both sides of the stream, the breeze carrying their merry melodies. Our guide had planned to take us on a path along the near bank. Aamir thought he was merely trying to take the least effort route and steered us instead to the other bank (the guide was actually giving us the right advice; the next day Atanu and Bulbul took an early morning trip following the river on the near bank and found it to be a better trail). The guide kept telling us the far bank trail was a “challenger course”, all of us failing to comprehend what he intended to convey. The meaning was clear soon enough when we saw (and could not stop laughing at) the nets, poles and ladders – a complete set up for “challenging” team building exercises - some of which were attempted by Aamir and Atanu, and instinctively avoided by Adi; nevertheless Aamir and Atanu did manage to wriggle him out through a net. Though it was not exactly what we had in mind for a nature trek, by no means was the trip a downer. Touch of the mountain air felt lovely and the manicured lawns soon gave way to wooded lanes and forest. There was plenty to see and discover as we kept walking. Blooming blue funnel shaped African lilies (agapanthus) in their typical umbrella shaped bunch. An elongated bunch of yellow-tipped tube-like orange aloe flowers springing from long toothed leaves, looking out for sunbirds to pollinate them. An amazing black shiny caterpillar with black, white and red spikes – I had never seen anything like it before, never thought a caterpillar could be so beautiful. 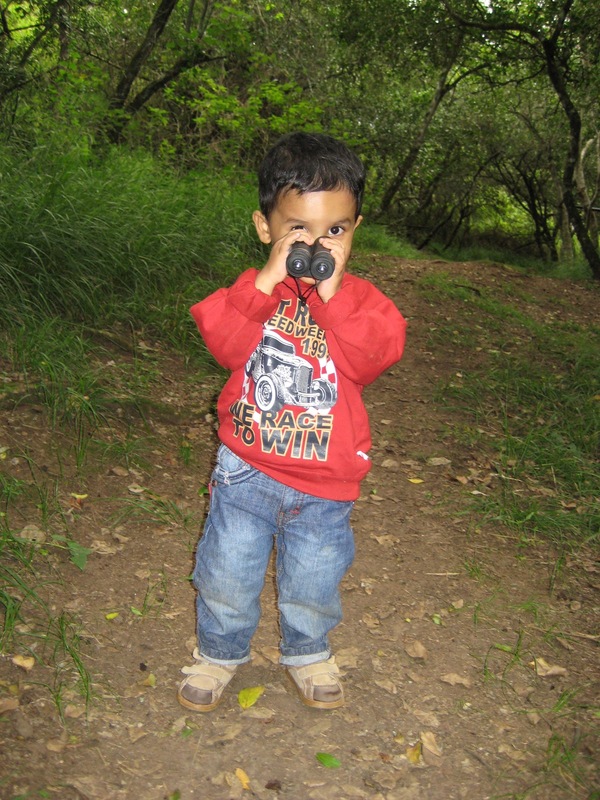 The greatest enthusiasm was shown by our youngest trekker - armed with his binoculars, he was not the one to miss out on any action or sighting! Even in the "summer" season, some bit of moss and lichen on the tree branches gave evidence of the chilly weather. Moss and lichen were words I used interchangeably (although I am certain this would have been part of my text book curriculum at school) - but now I am wiser. In fact, the two organisms are radically different and are not even in the same kingdom. Lichen is a complex group of plants depending on a close association between fungi and algae - a symbiotic relationship where the fungi surround the algae. The algae carry out photosynthesis and feed the fungi. The fibrous structures that make up the fungi add support to the algae and keep the algae from drying out. 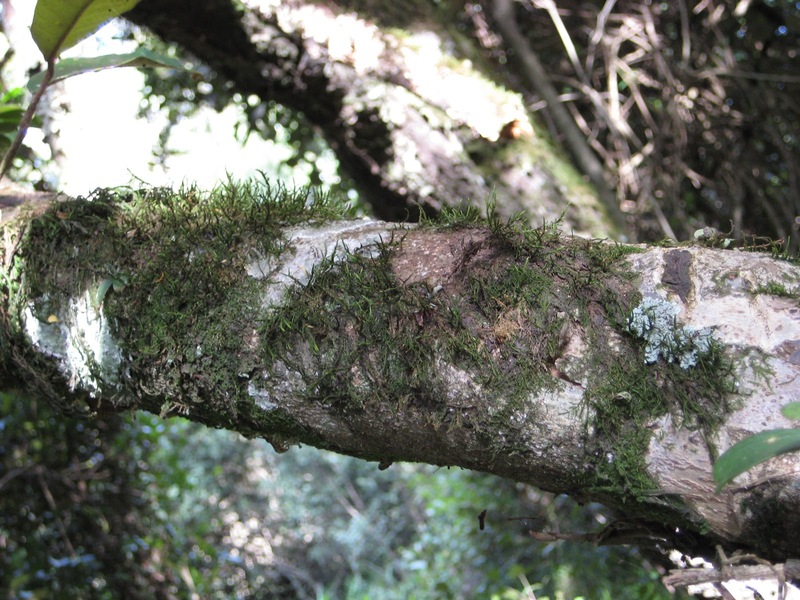 Lichens take different forms: crusty appearance often found on rocks; leafy or stringy often found growing on the ground and around trees; or like stalks with bright fruiting bodies. Moss, on the other hand, is a class of plants without flowers or roots. It usually grows as low, dense, carpet-like masses on tree trunks, rocks, or moist ground. I believe I saw both moss and lichen coexisting on at least one tree branch, though I could of course be wrong with my limited identification skills. We came back from the trail and found great hullabaloo atop two big adjacent trees. On closer look, we saw a troop of monkeys on them – Guereza or Abyssinian black and white colobus monkeys - beautiful black furs contrasting with the long white cloaks (around sides and lower back in u-shape), white whiskers and beards around the faces (giving old men looks) and bushy white tails. True to their reputation, they remained on the tree tops throughout; colobus monkeys spend almost their entire lives up in the branches, rarely touching the ground. They do not even need to come down for water, finding enough in the treetops to survive. The monkeys were engaged in “folivory” or the practice of eating leaves; tender high protein leaves being their favourite food. These monkeys have unusual stomachs, similar to the digestive systems of cows, which enable them to digest large volumes of leafy material and unripe fruits (that other monkeys cannot). They show another unlike monkey characteristic: they lack functional thumbs. In fact the word ‘colobus’ derives from the Greek word for ‘mutilated’ due to this unusual feature or rather the absence of it. The loss of the thumb may be an adaptation for quick movements through the trees; their hands and feet support well for their favoured movements - bipedal or quadrupedal walking on tree limbs (instead of swinging beneath them). All our eyes were glued to the monkeys as they used the branches as trampolines, jumping up and down on them to get lift off for leaps to the next branches. Though they usually made only short leaps across horizontal distances, my heart stopped every time they leapt up and dropped downward, falling with outstretched arms and legs to grab the next branch – their mantle hair and tails are believed to act as a parachute during these incredible leaps! From that point onwards we realised the colobus monkeys were not temporary visitors to the lodge; rather residents – chorus of far-carrying (even up to a mile) croaking roars serving as reminders through out our stay, especially during the nights – the male in a group declaring his might and right; in turn answered by neighbouring group males. We left the colobus monkeys to their leaf eating and moved to sit near the stream. Adi, like all children, was fascinated by the “plop” and the concentric circles when a pebble dropped in water, and devoted the entire time that we were there to produce the effect. Sitting by the river side, I could experience and appreciate nature in its details - how the water over time erodes the sharp edges to make rounded pebbles, how the water when it encounters unshakable boulders makes its way by flowing around, how the water takes away the soil on the banks exposing plant roots. We were content just to sit there and do nothing – till tea came calling to all except Adi and me (I have sometimes wondered if I am missing something by not knowing what an urge for tea feels like). The evening was spent in the chilly lawns amidst Christmas Eve celebrations – with all my energy spent on ensuring Adi keeps wearing his cap. In spite of the racket made by colobus monkeys, Adi and I dozed off the moment we hit the bed. I opened my eyes to the music of flowing water. Leaving Adi to complete his sleep with Aamir, I went out for a walk by the stream (Atanu and Bulbul had already left for their walk by then). It was a lovely walk in the flora, listening to the very vocal, mostly invisible fauna. Sometimes the fauna did show up - a ring necked dove with its black hind collar, the same caterpillar as the previous day still lingering on, a cisticola perched on a tree, the rare green ibis with its bronze plumage; the water playing in the background all the while. Atanu and Bulbul were back soon and it was time to assemble the team for breakfast and get started for the day. The first stopover for the day was at a point on the Equator, in Nanyuki, a market town in central-east Rift Valley region (at altitude 6389 feet or 1947 metres). We were standing at 0 degrees latitude – on the very line where the two hemispheres of the Earth meet (a board confirming that it was indeed the Equator)! There were a few young men waiting with a bowl, water and sticks to demonstrate the Coriolis effect; which we were naturally keen to witness. The square bowl had a hole in the centre. Our guide filled the bowl with water and put two sticks in it. When we were standing north of the Equator, the water when coming out of the hole appeared to turn right in a spiral, also rotating the sticks inside clockwise. When we were standing south of the Equator, the water when coming out of the hole appeared to turn left in a spiral, also rotating the sticks inside anticlockwise. And when we were standing on the Equator, there was no motion – the water and the sticks remained standstill, even when our guide tried to give them some motion. So what is the Coriolis effect? It was discovered by nineteenth century French engineer Gaspard C. Coriolis. The effect of the Coriolis force is an apparent (apparent is the key word here) deflection of the path of an object that moves within a rotating coordinate system. The object does not actually deviate from its path, but it appears to do so because of the motion of the coordinate system (in our case the moving Earth). Rather than flowing directly from areas of high pressure to low pressure, as they would on a non-rotating planet, winds and currents tend to flow to the right of this direction north of the Equator, and to the left of this direction south of it. The Coriolis effect is strongest at the north and south poles. It does not exist at all at the Equator, where opposing forces (the turn to the right and the turn to the left) cancel each other out. Because the Earth completes only one rotation per day, the Coriolis force is quite small, and its effects generally become noticeable only for motions occurring over large distances and long periods of time, such as large-scale movement of air in the atmosphere or water in the ocean. That implies it is highly unlikely that Coriolis effect was driving the water in its spiral movement in our demonstrations, at a minimum we would need an enormous bathtub hundreds of metres across for this to be demonstrated. When visiting a forest in Nairobi some time later, I was told (again by a local guide) that creeping vines follow the spiral as per the Coriolis effect. Again because a vine rotating around a tree trunk is so small in scale compared to a current in the Atlantic Ocean, it is doubtful that vining is a function of the Coriolis effect. Many scientists believe the main reason for one vine’s penchant for curling one way and another’s for moving in the exact opposite direction could be primarily genetic. Science may actually be in the process of discovering that plant kingdom has a left hand bias – a study found 92 per cent of vines twist anti-clockwise! On that day, while we continued on our journey, and Aamir tried to surf the net over mobile to find out more on Coriolis effect, our discussions centred on how the demonstrations would have worked. The overriding thought on my mind however was the thrill of having been at the Equator! Ferrel's law, named after American meteorologist W. Ferrel, is the rule that air or water moving horizontally in the Northern Hemisphere is deflected or pushed to the right of its line of motion while air or water moving horizontally in the Southern Hemisphere is deflected to the left of its line of motion. Ferrel's law, which predicts the directions of the large-scale circulations of the earth's atmosphere and oceans, is a restatement in global terms of the action of the Coriolis force.